After some hi jinx on the ground with the lovable animal leads arriving at the space station, two space probes head for the moon, our heroic animal duo competing with the banana fueled monkey astronaut. 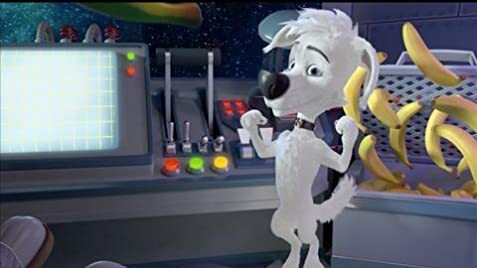 There the puppy lead encounters his space hero dog dad and a little green man, who rescues him with his sticky tongue. The plot and imagery are unsurprising. Their best concept is a fat very Russian cat than manages to channel Oscar Homolka. This proves to be a children's toon sequel with not too much to recommend it to big people.